Technology and globalization are changing the way you do business. And we are keeping pace. Changing the way legal services are provided. Our firm is intentionally structured to give you a direct connection to high-caliber legal and technical professionals who understand your industry. 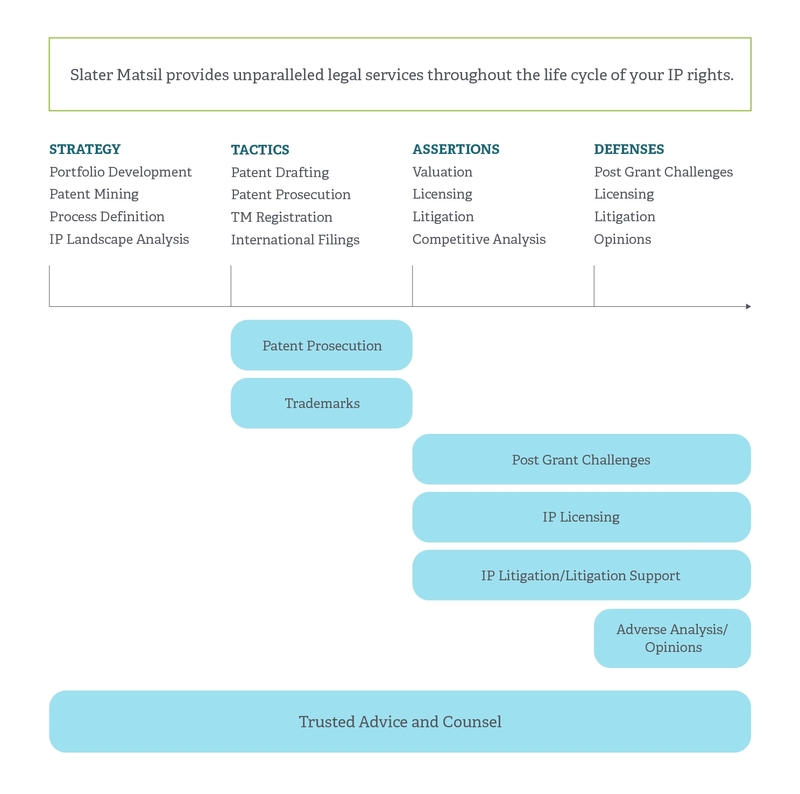 Since our founding in 1999, Slater Matsil has built a distinguished intellectual property practice founded upon bedrock principles of uncompromised quality, unsurpassed client service, and unceasing dedication to improving the practice of IP law. We bring this same commitment to our craft whether we are sitting with engineers to discuss their innovation, meeting with management to develop an IP strategy, or sparring with opposing counsel to assert or defend our clients' interests. We offer a portfolio of globally devised intellectual property services, along with multilingual personnel and internationally experienced patent professionals. From patent preparation through licensing and litigation, Slater Matsil bridges the intricacies of IP law and the industry-specific languages of engineering, technology and business. Choose any category to learn more about our specific patent and trademark services.